Meal planning and creating menus as a single person poses a unique challenge. Most of the advice on the subject is geared toward families which actually creates a lot of waste in terms of both food and time, when applied to cooking for one. So what's the single woman or man who wants to enjoy healthy meals at home, to do? 1. 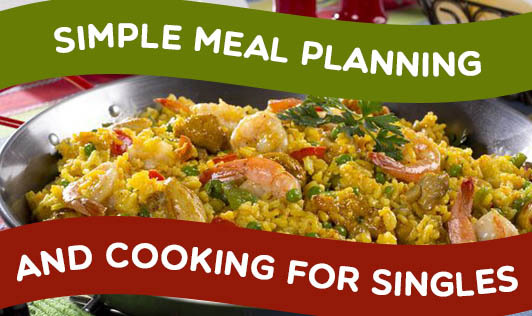 Plan your meals: Just note down a few dishes that you like to make in the upcoming week and then plan accordingly. Plan out when you have the time to make and eat all the meals on the list, put together a shopping list for the necessary ingredients, and you're set! 2. When shopping, start thinking in terms of food groups, rather than recipes. You need protein (pulses, eggs, chicken or fish) and starchy foods (cereals, whole grains), vegetables and fruits. Then combine these ingredients in different ways to create simple meals. 3. It's also good to include a "float" day when you eat extra leftovers, dine out or get a takeout, or prepare a simple meal. Planning seven meals a week usually results in food being thrown away. 4. Another key to cooking simply for one is that if a dish takes more than 10 minutes, or more than one pan, make more than one serving. Apply this rule to things like chapatis, rice, idlis and soups - things that reheat well. Also use this rule to rethink how foods can be cooked, using fewer pans. 5. Invest in small appliances. Use some of that money saved by eating in and buy a few small appliances. A mini food-processor, blender and juicer will not only make cooking easier by shortening the preparation process, but might also expand the menu options to include items sure to brighten up any menu-pureed soups, fresh juices, dips and more. If living alone, cooking often becomes a thankless chore, with no one to appreciate for fretting over the hot stove. It becomes easier to give in to the temptation of a take away than to cook a healthy meal. But with a pinch of planning and a dash of motivation, cooking solo can be fun and easy, benefiting the body and the bank account.